I recently picked up nine of the new China Glaze Tronica collection. The first I will be showing you is Hyper Haute. 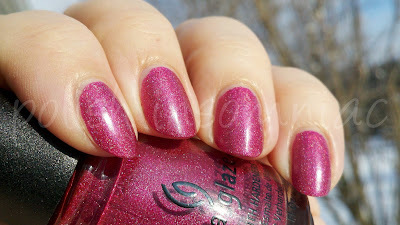 Hyper Haute is a gorgeous raspberry pink dispersed holo. The holographic qualities of this polish only appear in direct sunlight. This was two coats, no topcoat, no basecoat. It's worth noting that I put the first coat of this polish on last night by itself; it didn't flake or chip, as the OMG holo's would have!